Radioteletype (RTTY) is a telecommunications system consisting originally of two or more electromechanical teleprinters in different locations, later superseded by personal computers (PCs) running software to emulate teleprinters, connected by radio rather than a wired link. Radioteletype evolved from earlier landline teleprinter operations that began in the mid-1800s. The US Navy Department successfully tested printing telegraphy between an airplane and ground radio station in 1922. Later that year, the Radio Corporation of America successfully tested printing telegraphy via their Chatham, Massachusetts, radio station to the R.M.S. Majestic. Commercial RTTY systems were in active service between San Francisco and Honolulu as early as April 1932 and between San Francisco and New York City by 1934. The US military used radioteletype in the 1930s and expanded this usage during World War II. From the 1980s, teleprinters were replaced by computers running teleprinter emulation software. One of the more popular software tools for working RTTY is Ham Radio Deluxe and Digital Master 780. DM 780 makes it very easy to work RTTY. DM 780 gives you the ability to see multiple RTTY QSO's so you can quickly tune and call CQ or answer a CQ call. 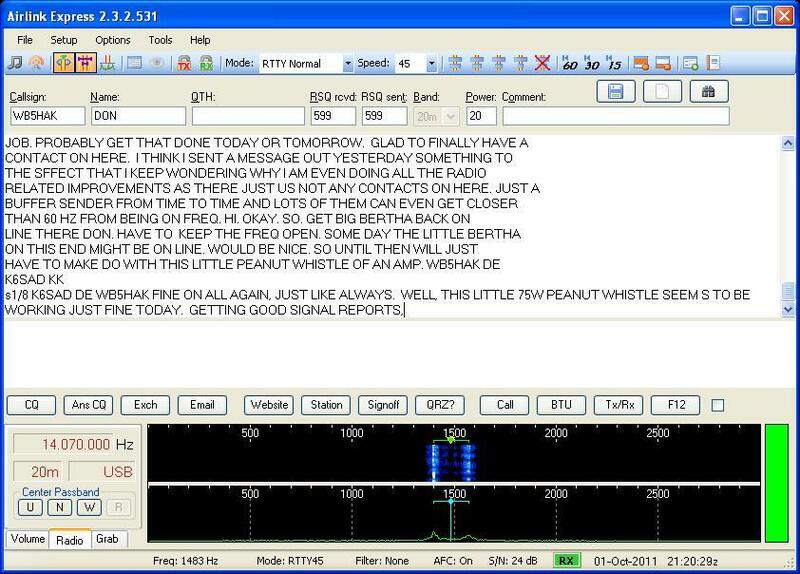 The image on the right is a screen capture of DM780 capturing a RTTY QSO. 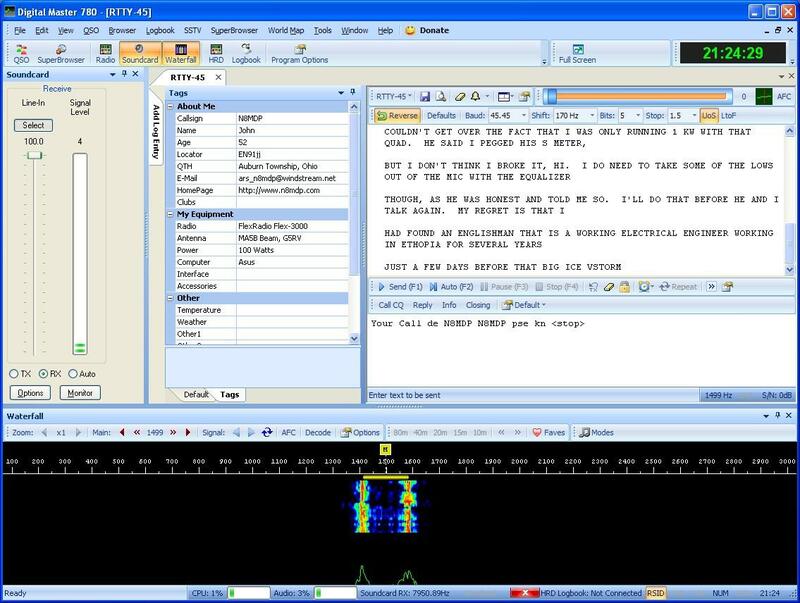 The screen shows the typical RTTY transmit and receive windows, but more importanlty, the "Waterfall" plot. The watefall plot is a very useful tool because it represents a graphical window that allows you visualize the station that are active and transmitting. The stronger signals have brighter colors, while weaker signals will not be as bright. Using the waterfall graphic really is what makes RTTY1 operation easy to tune and enjoyable to work. All that is really needed to run RTTY is an HF radio, a computer with a sound card, an interface that connects to the PC and the transceiver such as a RigBlaster or a homebrewed audio coupled solution and Ham Radio Deluxe. A relatively new piece of software I found that runs RTTY (as well as PSK and MFSK) is Airlink Express from KR1ST. Airlink Express is a user friendly digital mode software package for the Amateur Radio Operator. The software is compatible with Microsoft Windows XP, Microsoft Windows Vista, and Microsoft Windows 7. With the release of Windows Vista and Windows 7, Microsoft introduced a new sound architecture. Airlink Express is developed to support this new sound architecture, yet it maintains complete backward compatibility with Windows XP. 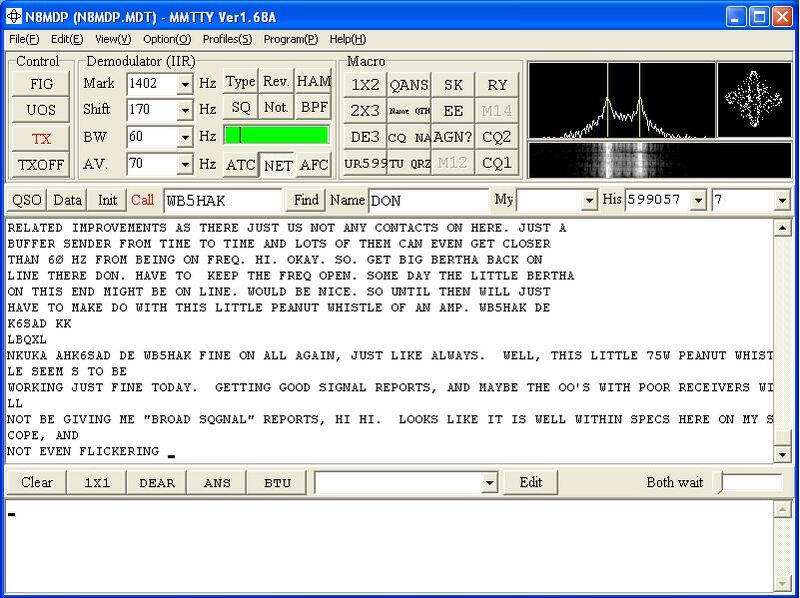 By far, one of the most popular RTTY programs around is MMTTY by JE3HHT, Makoto (Mako) Mori. Makoto is also the author of another very popular software called MMSSTV which is used to decode analog slow scan television pictures. MMTTY is very easy to use and it is FREE! Tuning RTTY signals is not difficult. MMTTY makes it easy. MMTTY comes with a spectrum display (called FFT Display), an XY scope, and a waterfall display as shown below. The spectrum display (FFT) is useful for initial tuning to get close to a signal. The XY Scope is then used for fine tuning. The two yellow vertical bars represent Mark and Space frequencies. The final tuning goal is to line up the signal with these vertical bars. Once this is accomplished, the signal indicator on the MMTTY screen should go above the squelch threshold and you will begin to see readable text begin to scroll across the screen. It is that easy!.